Excellent opportunity to own what could be a spectacular doll house in a wonderful guard gated community. The location is perfect... the house needs your personal touch... cosmetics required... and have fun doing it. Big Wonderful Floor Plan on Over-sized Corner Lot with Real two car Garage! Mostly updated with newer Roof, recent Kitchen, period style hall bath and Central A/C. The Spacious Living Room is flanked by a fireplace and and formal Dining Room. Two family rooms (one is ideal for reading and/or music area) The updated kitchen with Shaker Style Cabinets has access to the interior Laundry Rm & the Very Spacious 2-Car Garage. An important Silver Bluff home that is absolutely worth showing. Room for pool! Fantastic opportunity to finish your dream house at your taste. The important stuff is there. New porcelain floors, new AC, new wood doors, granite countertops, kitchen. Spectacular gazebo with bbq. next to the pool. Space to plant your own greens, fruits and vegetables. A step from Aventura and the schools. Planswere done by architect and are in the process of being approved. New buyer would take over. New septic is needed. Great property sold AS IS. Sky Lake...better than new! Turn-key is an understatement when describing this young, modern, totally renovated home. Professionally designed and customized with open floor plan, new porcelain tile floors throughout, new gourmet kitchen with gas cooking and extended built-in buffet, all new baths, new impact glass windows & doors, wired for surround-sound in living room & master bedroom plus a beautifully landscaped yard. Ready for a new owner! 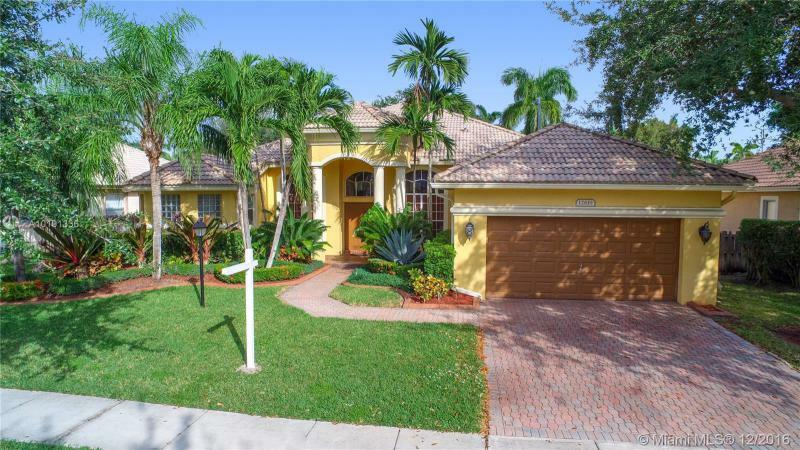 Remodeled 4 Bed+Office, 3 Bath, Monterey Model Pool Home in Prestigious Pembroke Falls. Features: Contemporary Kitchen, Mahogany Cabinetry, Granite, Island, SS Appliances, Gas Range, Wine Cooler, Breakfast Nook; Spacious Master Suite; Custom Office & Millwork; Renovated Guest Baths: Granite Vanities, Shower Enclosures & Designer Tilework; Newer A/C & WH; Expansive Screened Lanie & Travertine Patio, Heated Saltwater Pool, New Marcite, Fiber Optic Lighting; Tropical Landscaping. Perfect for ENTERTAINING! Executive Custom home with hardwood cherry floors sitting on a wide lakefront view. The open floor plan encompasses five spacious bedrooms with plenty of room for study, sleep and storage, five bathrooms, and a stylish upgraded kitchen with tall cabinets, stainless steel appliances and granite countertops that flows through to the family room and flows to the rear paved patio. Downstairs bedroom with private ensuite. And walking distance from two of the most sought after Charter schools in the area.